SAN FRANCISCO -- It cost $25,000 to clean up 11 tons of garbage in San Francisco's Golden Gate Park after cannabis enthusiasts swarmed there Wednesday for an impromptu festival celebrating pot. The gathering is held annually because the time 4:20 -- a.m. or p.m. -- has been associated with smoking marijuana since the 1970s and the date April 20 has become a counterculture holiday. 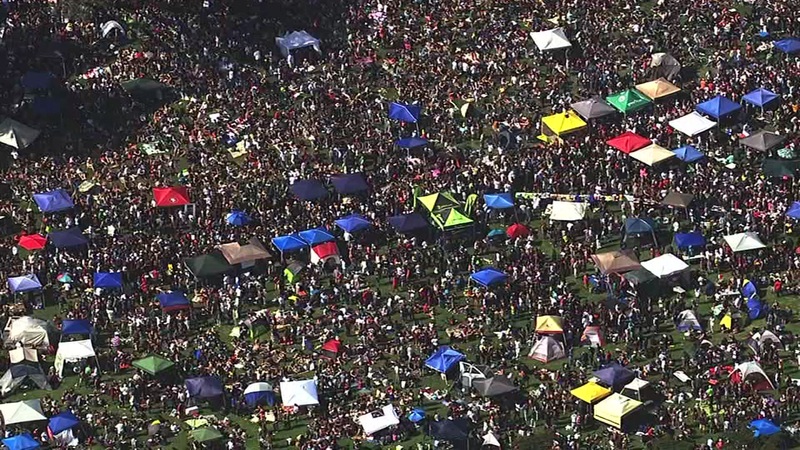 Thousands of people descend on Hippie Hill every year for the festivities, which are not sanctioned but generally tolerated by the city. While the gathering is largely peaceful -- San Francisco police reported only eight arrests -- every year the smokers leave behind thousands of pounds of trash, according to San Francisco Recreation and Park Department spokesman Joey Kahn. Last year, celebrants left behind more than 17,000 pounds of garbage. Kahn said this year's waste total was 22,000 pounds of garbage and the city spent $20,000 on labor cleaning the park up Wednesday evening and this morning. The parks department also spent $3,500 on materials and supplies like portable toilets and $1,500 on dump fees, Kahn said. Those figures don't include costs incurred by other city agencies such as the police or public works. Police made few arrests Wednesday, preferring to make sure the event remained safe, but did make one arrest in a robbery by a man who threatened two teen boys with brass knuckles, according to police. The 19-year-old robber approached the two 15-year-old boys near the corner of Stanyan and Oak streets at 6:18 p.m. and took their cash. The boys reported the theft to police, who chased down and arrested the suspect, police said. Three other people were arrested for outstanding warrants, one was arrested for being drunk in public, one was arrested for assault and two were arrested for resisting arrest, police said.